Club Penguin Cheats by Mimo777 Club Penguin Cheats by Mimo777: Club Penguin Favorite Iggly Reviewed By You! "My favorite igloo is the igloo with a yard! Where else would I put all my plants? It looks great and is fun. I use it for a beautiful garden, or sometimes an outdoor party. I think it is the best igloo! Me and my buddies love to hang out in my garden and look at all the flowers around us. Thanks for making it CP!! Waddle On!! 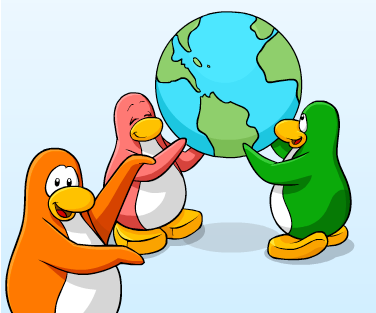 :)"
Since all you awesome penguins are so excited about the Art for Haiti, Club Penguin wants to know what you have done to make a difference in your community (Big or small). So if you have helped your community, write a review about it and submit it to Club Penguin. If they choose your review, you will earn 10,000 coins. Woot! I am curious, too, how many of you have help your community. Be sure to let me know what you have done! oh cool. Nice review by you! Well me and my lil sis were cleaning our pond. We found a ton of bottles! Hey Mimo! Tomorrow is the first day of school, so I can't mod for long. Just a reminder. I Anonymous agree with the top anonymous..lol..I mean ya cp is kinda boring now..u guys remember that August sneak peek?Well there was a pic of mount(now we know what it is) and there was something red(idk what it is) and a pic of the EPF logo(could that mean new mini-games..but it didnt happen) and lastly a bubble with a stamp in the ocean(that prob meant new stamps for puffle rescue)! So lets see we only know about the Mount Expedition now..LAME! So what is that red thingy? When are NEW stamps coming out?!! In the membership page they promised with LOTS of new stamps(check if you want) and all what we've seen now are two new stamps! When will NEW and HARDER epf minigames come out?! When will cp get cooler and less baby-ish??! Will we ever see Elmo or Cookie Monster on cp?? if we did,Im to my room's corner,on the window,out of it,in mid air,and on ground...DEAD! p.s thnx 4 ur help and hard work Mimo! I got one once. once it was an idea for new sports stuff and i said skateboarding stuff would be awesome and one time I said what my fav part of becoming a ninja was and billybob replied to mine. he said "I'm glad to see that you were so determined to become a ninja!" and arent u on my buddy list and we met all together with fredfan4ever? Lol, yeah. mimo says funny stuff like that. he says winners are wieners and funny as phunny sometimes and it makes his site rather 'phunny' Hope this helped! Wow 10000 coins. That is plain old crazy!. I could buy sooooo much. I love cp. It's good isn't it? Great work! That helps the enviroment. Nice work! Me and my family puled weeds at my school. Cool. Did you make a bottle figure? Like a figure made from bottles. Or did you recycle them? Have fun at school. I go back Monday. I get to see my friends again! lol, guess so. I dunno if Mimo did dat on purpose or if he did it by accident. Either way, it's still funny. Cool! *Sniffle* They grow up so fast don't they? Actually... no, not really. Take a picture of the tree everyday when it starts to sprout then speed it up. lol. Bye bye nother comment. We'll miss you! So when is your what-cha-ma-whooz-it gona be fixed? Hopefully you will be able to come back soon. we know but when is your power ganna be back?? So cool, my school helped haity in a big way, we had many fundraisers, and they picked 5 people too be in a newspaper article and guess what they picked me! I was so happy, but it was really cool, I think there should be something done for the flood in Pakistan too. Wouldn't it be actually soooo rubbish if you got the money, but you were a nonmember? No fair.. u go to school today, i went yesterday!